The dormant volcano La Malinche dominates the landscape in an early shot of “Canoa: A Shameful Memory” (1976), a mute witness to the human eruption that occurs below and which shapes the film. 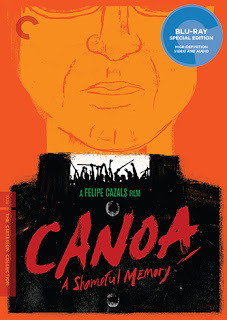 Based on a real 1968 event, “Canoa” reconstructs the murder of several university employees at the hands of a bloodthirsty mob of villagers from the impoverished town of San Miguel Canoa, just outside the city of Puebla in Central Mexico. 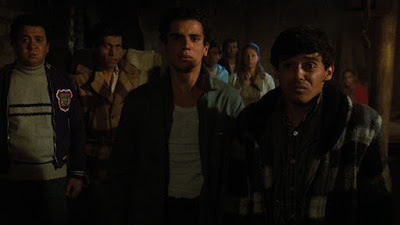 The young men are merely on a weekend trip to climb the volcano, but the locals, whipped into a frenzy by propaganda spewed by the town's corrupt priest (Enrique Lucero), become convinced the tourists are student communists who have come to defile their religion. The event was still fresh in the minds of many Mexican viewers and directly linked to even more notorious traumas of a violent year, which left director Felipe Cazals and screenwriter Tomas Perez Turrent a difficult balancing act, seeking to engage a movie audience while not unduly exploiting real tragedy. Their solution is a film which some odd tonal shifts that complicate any immediate reaction or analysis. The film begins with a very low-key scene in which a field reporter at a tiny, cluttered desk phones in news of the lynching to another reporter in a largely deserted newsroom, the latter being unimpressed as he pecks away at his typewriter to record the names of the victims. The film then shifts to a brilliant sequence in which the noise of a bombastic military parade is contrasted with the near-silence of the victims' funeral where protestors carry signs reading “We Demand Justice.” Cazals' presentation is so assured and efficient, the viewer can already safely guess said justice is unlikely to be forthcoming. From this point, Cazals and his crew (he also gives ample credit to veteran cinematographer Alex Phillips Jr. as a shaping voice) mix and match a variety of techniques. Faux-newsreel interviews situate one local man as a de facto narrator and guide to the town's troubles, which revolve around poverty, alcohol, and that corrupt priest who has leveraged his divine authority into a privatization scheme to enrich himself and (perhaps) the church on the backs of poor, uneducated laborers. The film also spends a great deal of time with the young victims-to-be as they casually joke around with each other and remain blissfully oblivious to the fate that awaits them even as hysterical shrieks about the “Outlaws!” and “Communists!” blare over the loudspeakers that constitute the town's entire access to media, and which are, of course, controlled by the priest. This naïve interplay provides Cazals the opportunity to ratchet up the suspense to nearly unbearable levels as the audience has been warned from the start of what will happen. It's fair to ask whether traditional suspense should be built up so relentlessly (including a final delaying cutaway once the angry mob leader's axe hacks through the door) while recounting a story of real victims, but the film doesn't let viewers escape with a cheap thrill, depicting the mob attack in brutal images that leave enough to the imagination to make it even more unnerving. I find little evidence of the “gritty documentary style” promised on the blurb on the back of the Blu-ray (and mentioned by Guillermo del Toro in one of the disc's extras). The faux-newsreel footage is so stilted and mannered, it feels more like it's mocking the reliability of the format than striving for verisimilitude, and hand-held camerawork does not equal “documentary style” - gritty or otherwise. 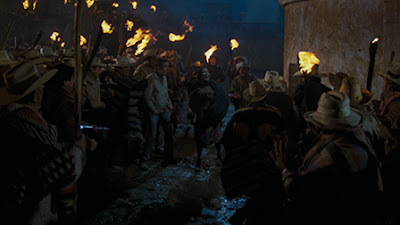 “Canoa” is more a horror film than anything else, and the real horror is that the eruption of violence may be as natural as the past and future eruptions of La Malinche. Sure, the priest and his minions spew poisonous rhetoric and the disinterested government officials gladly allow the uneducated laborers to be exploited, but the ultimate explanation for why hundreds or even thousands of people could band together one night to murder several men may boil down simply to one fact: that's just what people do. The film is presented in its original 1.85:1 aspect ratio. This restored transfer was supervised by director Felipe Cazals and looks quite strong, as you would expect. Image quality is sharp throughout with an appropriately grainy look. The colors are quite rich and every now and then I thought perhaps a bit too much so, but that's hardly a complaint. The linear PCM mono audio mix is on the flat and shallow side and I suspect is meant to be so. I think the film's audio design (no music, by the way) is one of its strongest aspects, with very effective use of strategic silence contrasted with louder environments, and this subtle mix renders it all quite well. Optional English subtitles support the Spanish audio. Unfortunately, Criterion hasn't included too much on the extras front. A brief introduction (3 min.) by director Guillermo del Toro shares his appreciation for the film, but not too much else. The substantive extra is a lengthy conversation (2016, 54 min.) between Felipe Cazals and director Alfonso Cuaron. Cuaron is both a big fan of the film and one hell of an interviewer – he can conduct as many of these for Criterion as he wants to. It's a treat to see two great Mexican directors of different generations (Cazals is 24 years older than Cuaron) get the time to discuss their craft in detail. The focus is on Cazals, of course, but some of the best interplay involves obvious differences between them – Cazals dismissed the use of music in films out of hand, prompting an exasperated chuckle from Cuaron. A lengthy theatrical trailer (5 min.) rounds out the collection. The slim fold-out insert booklet includes an essay by critic Fernanda Solorzano. Both Del Toro and Cuaron argue for “Canoa” as one of the most important Mexican films ever made. Criterion has provided a solid transfer of this influential films which I suspect even many ardent cinephiles have not previously seen. The extras on the sparse side, but it's great to expand the Criterion Collection to include more Mexican cinema.